Scientists at LMU and TUM have optimized the SeisSol earthquake simulation software on the Supercomputer SuperMUC to push its performance beyond the “magical” 1 petaflop/s mark – one quadrillion floating point operations per second. Geophysicists at LMU use the SeisSol earthquake simulation software to investigate rupture processes and seismic waves beneath the Earth’s surface. Their goal is to simulate earthquakes as accurately as possible to be better prepared for future events and to better understand the fundamental underlying mechanisms. However, the calculations involved in this kind of simulation are so complex that they push even super computers to their limits. In a collaborative effort, the workgroups led by Dr. Christian Pelties at the Department of Geo and Environmental Sciences at LMU and Professor Michael Bader at the Department of Informatics at TUM with the support of the Leibniz Supercomputing Center of the Bavarian Academy of Sciences and Humanities have optimized the SeisSol program for the parallel architecture of the Garching supercomputer “SuperMUC”, thereby speeding up calculations by a factor of five. Using a virtual experiment they achieved a new record on the SuperMUC: To simulate the vibrations inside the geometrically complex Merapi volcano on the island of Java, the supercomputer executed 1.09 quadrillion floating point operations per second. 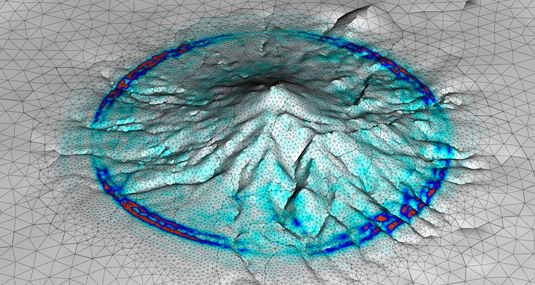 SeisSol maintained this unusually high performance level throughout the entire three hour simulation run using all of SuperMUC’s 147,456 processor cores. This was possible only following the extensive optimization and the complete parallelization of the 70,000 lines of SeisSol code, allowing a peak performance of up to 1.42 petaflops. This corresponds to 44.5 percent of Super MUC’s theoretically available capacity, making SeisSol one of the most efficient simulation programs of its kind worldwide. The next steps are earthquake simulations that include rupture processes on the meter scale as well as the resultant destructive seismic waves that propagate across hundreds of kilometers. The results will improve the understanding of earthquakes and allow a better assessment of potential future events. The project was funded by the Volkswagen Foundation (ASCETE project), the Bavarian Competence Network for Technical and Scientific High Performance Computing (KONWIHR), the German Research Foundation (DFG) and the Leibniz Supercomputing Center of the Bavarian Academy of Sciences. The continuing development of SeisSol is also supported by the “DEEP Extended Reach”, VERCE and QUEST projects of the European Union.